Every grill master knows that you can’t flip over a steak with a standard spatula. To get the job done right, you need to have a good pair of tongs. 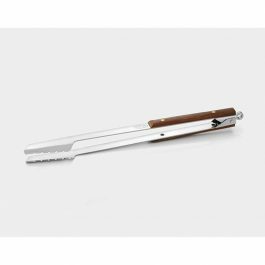 These stainless steel grilling tongs are great because they have a sturdy walnut handle that makes them easy to grip. There is no reason to not have all of the necessary grilling tools when you are trying to prepare a fantastic dish.